'The Crossing Sweeper' by William Powell Frith, 1858; oil on canvas. The painting was done whilst Frith was working on his great painting, Derby Day. "As a stopgap," he wrote in his autobiography, "I began to paint a small picture of a lady waiting to cross a street, with a little boy crossing-sweeper besieging her in the usual fashion." Frith painted at least 4 other versions of this subject but this is the earliest known, the largest and most detailed. The crossing sweeper was a common sight on the streets of London in the nineteenth century. The large amount of horse drawn vehicles meant that crossing the road could be hazardous and sweepers provided a service to the affluent. 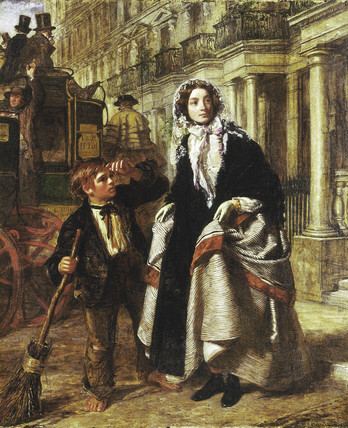 The sweeper became well known particularly through the character of Jo in Charles Dickens's Bleak House (1852-3).